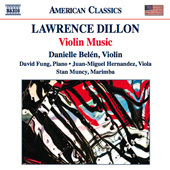 Danielle Belén, 2008 Grand Prize Winner of the Sphinx Competition, makes her debut recording on this disc of violin works by Lawrence Dillon. In the 25 years that separated 1983 from 2008, the music world underwent dramatic shifts in technology, resources and fashions. Through it all, Lawrence Dillon’s artistic concerns remained steadfast. A love for lyricism, a dash of wit, and what he has called “an irresistible urge” to connect with the Classical music heritage have remained easily identifiable hallmarks of Dillon’s music. The nine works on this recording trace these ongoing characteristics, which can also be found in his vocal, chamber and symphonic works, through the lens of music featuring the violin. In the summer of 2006, violinist Piotr Szewczyk organized a project he called Violin Futura: he asked fifteen composers to each write one short piece—two to three minutes—for unaccompanied violin. Dillon agreed to do it, thinking a short solo piece would be an easy task. Months went by, though, and “I became confused about the requested duration,” Dillon writes, “thinking Piotr had asked for a one-minute piece, at which point I found the project causing me more trouble than I had imagined.” The problem wasn’t how to write a short piece, but choosing which of an infinite number of short pieces he should write. Szewczyk wrote back, politely correcting Dillon’s mistake, explaining that he was supposed to have written a piece between two and three minutes long, as opposed to the one-minute compositions that had been provided. To make amends for his error, Dillon dashed off Mister Blister, a speedy showcase for virtuosic violinist, that afternoon. “I was raised not to waste anything,” Dillon writes, so he collected and rearranged the other sixteen pieces into a whimsical meditation on celebrity called Fifteen Minutes, after Andy Warhol’s observation that “In the future, everyone will be world-famous for fifteen minutes.” Fifteen Minutes requires the violinist to shift styles drastically from one moment to the next (sometimes several shifts within the course of a single movement), surmount enormous technical challenges, and even play kazoo (in Dissonance). The set concludes with a take-off on the most famous minute-long piece in history, Chopin’s Minute Waltz, from which Dillon removed one beat from each measure to create Minute March—rounding off this quirky set with a bit of postmodern decomposition. Ultimately, the combination of Dillon’s comical mistake and his frugality paid off: Szewczyk gave the premières of both Mister Blister and Fifteen Minutes and posted them on his website, where Danielle Belén found them a year later, when she was trying to decide which American composer to record on her début album. In the early 1980s it was fashionable for composers to write thorny, modernist works with glimpses of traditional tonality peeking through. “I thought it would be much more interesting, and more in keeping with my life experiences, to create a piece that punctured a sweet surface with a passage of intense fragmentation and distortion,” writes Dillon. Façade takes an 1890ish waltz, a pretty salon melody, and twists it through some increasingly irrational harmonic shifts until it shatters into inarticulate fragments. After a minute or two of stumbling about in confusion, it gradually reassembles itself into a fragile version of its former self. Just as he was completing the final draft, a phone call informed him that the commission had been cancelled. The shock of suddenly being left with an enormous, nearly completed score and no hope of a performance was devastating. After a few months of despondency, Dillon decided that he would have to destroy the concerto in order to move on. “I presided over a ritual burning of the manuscript and drafts,” he recalls, after which he wrote a piece that would be its polar opposite: Bacchus Chaconne. Bacchus Chaconne starts with a slow, elegiac canon, but then abruptly shifts gears into an irreverent, back-beat-dominated dance. The violin and viola engage in a bit of call-and-response competitiveness, each trying to out-do the other in embellishing a simple, repetitive chord progression, the chaconne of the title. In the end, this cheeky little piece helped clear the air for the composer, and he was able to resume work with a fresh vigor. Though it was originally scored for flute and piano, Dillon had always had in mind that Sonata: Motion could be adapted for violin. When Danielle Belén contacted him in the fall of 2008 about recording his complete violin works, he decided the time for an adaptation had come. The first movement (Motion/Emotion) is a perpetual motion featuring a persistent two-against-three against-four rhythm. The second movement (Emotion/Commotion) is like a kid sister to Façade: a violent opening gives way to an introspective passage that gradually drifts off into a slightly tainted B flat major. The final movement (Commotion/Motion) is in rondo form, with a folk-like melody framed by wildly antic homages to early rock-and-roll. Starting in the early 1990s, Dillon began writing a number of vocal works to his own texts. Several of these songs have been subsequently transcribed for instruments. Spring Passing for violin and marimba and The Voice for violin and piano are two examples. Gray petals in the sky. And though I tried, I knew they’d won. And yours is every eye. This version of Spring Passing shifts back and forth between metered and temporal notation, allowing the violin and marimba to float in and out of phase with one another, like two closely connected spirits in different states of being. It shivers in my bones. A will of its own, within me. The final piece on this disk, The Voice is a transcription and embellishment of that aria for violin and piano.